Emeka Mba who currently heads QuestechMedia, a specialized media & Entertainment consulting practice, has more than 27 years’ experience in the converged fields of media, entertainment and technology, as well as regulatory policy management, is considered by many of his peers as a leading visionary and thinker on the role of government policy and technology in shaping the trajectory and growth of the sector, and its impact on social and economic development. 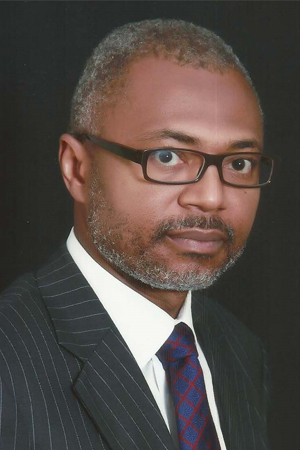 Emeka served for two and half years as Director General/CEO of the National Broadcasting Commission (NBC), Nigeria’s broadcasting regulator. Where he worked to reshape the NBC and raise funding for the analogue to digital television transition. In 2015, Emeka was awarded the African Regulator of the year for his ground-breaking work in the sector. Prior to appointment as DG NBC, Emeka also served two terms as the Director General of the National Film Video Censors Board (NFVCB), the federal government agency responsible for regulating films and video works distribution and exhibition in Nigeria. He also was managing director of Phillips Media Entertainment Ltd, a specialized media entertainment consulting service of Phillips Consulting Nigeria, and was for eight and a half years, Regulatory Affairs Manager for MultiChoice Nigeria, responsible for Regulatory strategy and Policy. He also managed and was responsible for Development of Local Programming Policy, conceived and facilitated the launch of the continent’s first satellite movie channel “AfricaMagic” on the DStv bouquet. Emeka has a BSc. Mass Communications and an Advanced Management Programme (AMP) diploma in Media & Entertainment management from the IESE Business School of New York; Mr. Mba also completed the Strategic Management of Regulatory and Enforcement Agencies Program, at Harvard University, John F. Kennedy School of Government, and Executive Education.